CNC-machined aluminum extra-long glue-in insert for carbon forks with integrated top cap bolt anchor threads. This insert replaces the standard expansion plug and adds extra strength to the steering tube. It is 123mm long and 23.8mm in diameter, so it supports almost the top five inches of the steering tube and provides greater strength under the spacer stack. 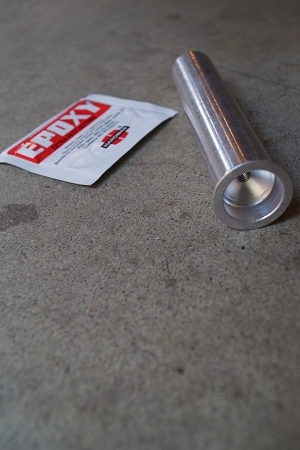 It comes with a blister pack of two-part epoxy to glue it in after the steering tube has been cut to length. This was designed for ENVE Forks, so they will work on any Enve carbon road fork except the older 1.0 model which has a thinner wall steering tube. It will work on any carbon fork with the appropriate inside diameter. You must measure your own fork's steering tube ID. We don't have data on all forks, so we don't know if it will work on your fork unless you measure. You can use the packet of epoxy that is included with the insert, or go to a hardware store and purchase JB Weld, two part epoxy. **NOTE: Do not over torque the top cap bolt. Top cap must be tightened to a minimum torque to remove headset play, but no more. This is about 1 or 2 nm. Only tighten the top cap bolt while the stem pinch bolts are loose. Failure to follow the instructions will result in breaking the epoxy bond and you will have to start over. *Watch the video for installation instructions.